Indiana had a hell of a season. Beat Kentucky. Beat Ohio State. Beat Michigan State. Lost to Kentucky in the regional semis. Still, a spectacular showing, and the Hoosiers are preseason No. 1s and prepared to do even greater things. So why not treat that 2011-12 season as a prelude, as just the start of a dynasty? Or you can hand out commemorative rings the night before the season opener. What better way to celebrate how you made it to just four wins from a championship? Sophomore guard Remy Abell posted his, and they're lovely. 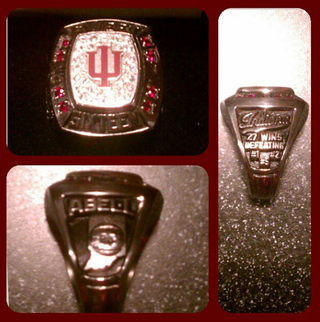 "Sweet Sixteen" engraved on the front, "27 Wins Defeating #1 #2 #5" on the side. This is the sort of thing a Cinderella CAA team does. The Big Ten is going to be dominant in hoops this year—I'm sure the students of rival schools won't mockingly bring this up throughout the season.